Fane Valley, the Northern Ireland agri-food business, has bought the Irish duck producer Silver Hill Foods. County Monaghan-based Silver Hill Foods produces premium ducks, largely for export markets in the UK, the EU and Asia. Fane Valley said the deal is part of its strategy of investing in food companies with strong growth potential. Silver Hill Foods is a long-standing supplier to Asian restaurants in the UK. In recent years, it has sought to diversify its export markets, particularly in south-east Asia. Chairman Stuart Steele said the deal was good news for its employees, "especially with Brexit causing uncertainty in this region". Silver Hill Foods is a cross-border operation - its main processing plant is at Emyvale in the Republic of Ireland and it has farms in Northern Ireland. It is understood that Fane Valley has assessed that Brexit poses risks to the business and concluded there are sufficient contingency plans in place. Those include Silver Hill Foods' increased focus on non-UK markets, which is hoped could double the size of the business in the next five years. Trevor Lockhart, the Fane Valley chief executive, said it was committed to future investment in Emyvale to enable Silver Hill Foods to meet growing demand. 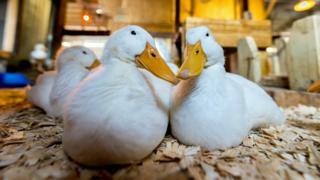 Fane Valley has an existing relationship with Silver Hill Foods as its duck feed supplier.